Review of the book, Teaching Mathematics and Computer Science, 2008,Vol. 6, No.2, pp. 415-420. This book provides insights drawn from the authors’ extensive experience in teaching Puzzle-based Learning. Practical advice is provided for teachers and lecturers evaluating a range of different formats for varying class sizes. Features: suggests numerous entertaining puzzles designed to motivate students to think about framing and solving unstructured problems; discusses models for student engagement, setting up puzzle clubs, hosting a puzzle competition, and warm-up activities; presents an overview of effective teaching approaches used in Puzzle-based Learning, covering a variety of class activities, assignment settings and assessment strategies; examines the issues involved in framing a problem and reviews a range of problem-solving strategies; contains tips for teachers and notes on common student pitfalls throughout the text; provides a collection of puzzle sets for use during a Puzzle-based Learning event, including puzzles that require probabilistic reasoning, and logic and geometry puzzles. 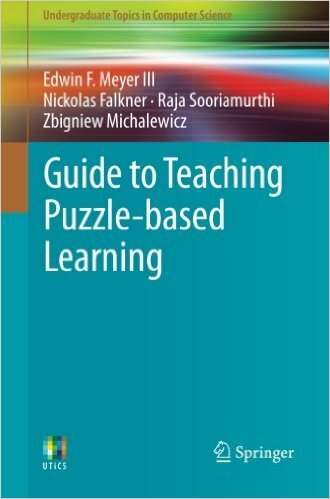 This unique textbook/guide will be of great interest to instructors on all levels who wish to experiment with the Puzzle-based Learning approach. This approach has been successfully applied in universities, high schools, professional organizations and leading companies. Click here to find out information about purchasing Guide to Teaching Puzzle-based Learning book.